It’s not Google or Facebook’s fault they’re killing journalism while punditry disguised as news overtakes disturbed ground. This simply is progress, which in its turn produced the printing press and a revolution in communication, not to mention religion, science and literature. Progress, like the stock market, shoots up and down. You have to step back to see the larger trend upward. Now we’re hurtling toward a sort of Wild West before 1900. We were less civilized then: Fistfights broke out in legislatures. Editors were horsewhipped and occasionally shot. Lynching was normal in parts of America. Journalism as we know it today grew out of boiling pots of opinion. Every town had several papers, all biased in the extreme and plenty proud of it, too. The current path leads back into this stew, only stir in a poisonous helping of instant commenting and an electrified grapevine, as well. This hardly looks like an improvement. Society wasn’t better in this gauzy golden age, even if Mark Twain was funny as hell at the National and the Holbrooke in his time. The low quality of journalism didn’t help. The evolution since then to a pale science seeking truth through vetting facts and accurate quoting was a big part of civic progress. Modern journalism has had its issues, too, for sure: Corporations hopping in when newspapers, radio and TV grew into healthy businesses worthy of “business decisions.” Celebrity journalists, a growing craving for sensation, an elite sprouting from the professionalization of the craft, a lot of swagger for no good reason, as it turned out. No doubt there’s a healthy middle ground, though it’s unlikely we’ll see that anytime soon. For news media today, it’s mostly a riches to rags story. Even online-only operations are troubled, unable to get off the investment teat. Larger enterprises like Buzz Feed, the Huffington Post and Vice are going through the same layoff grinder as Gannett and McClatchy. 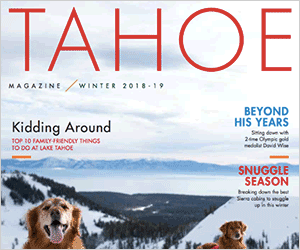 This is not for lack of readers/viewers or even the effectiveness of print advertising, ironically enough, at least not in Truckee or western Nevada County. Advertisers still need the right creative, offer, call to action and to sell something people want at the right price, of course. But the newspapers here still attract the greatest audience of people with higher income, education and civic interest — lifeblood for local businesses. And their print advertising done well … works. Advertising remains abstract, an art, even counting clicks and time on site or collecting data for future targeting. The choices are many, options cheap. Commoditized, as the marketing types put it, yet always there’s the impetus to break through the clutter. The economists have come to understand consumers, never mind nervous advertisers, as something other than rational actors. But facts don’t have to make sense to us to be facts, and for whatever reason Google and Facebook have taken the lion’s share of advertising that used to go to news media. This is progress, of course. The way things go. Out with Gutenberg at long last. In with the web and whatever comes next. Only, for now anyway, they’re siphoning away what funds the Fourth Estate, baby as well as bath water. This is the essential problem as news enterprises large and small hunt for business to replace what no longer supports journalism. Something remains. The New York Times and The Washington Post have gone lean — The Times eliminating its copy desk in one stunning move — and figured out how to make themselves profitable through online subscriptions. National television is still hanging in there, too. But there’s a tenuous feel to this. Streaming video is chipping away at the networks, and we’ll see how much President Trump has bumped up interest in The Times and The Post. The cost in credibility to these journalistic paragons joining the resistance against the president seems high, though. The cable news networks hardly merit recognition as news, so much opinion has leaked into their programming. Public broadcasting’s fiscal health is more promising, both nationally and regionally. Donations have grown, and PBS and NPR have been able to invest modestly in their news resources. Famously “Minnesota nice,” their brand of journalism is fair-minded and decidedly unsensational, if tinged liberal. Bloggers occasionally break news, though that’s rare, buried well in commentary, and tangy with their opinions, hardly consistent journalism. Advocates and aggregators dominate as the number of practicing journalists declines — half the newspaper journalists of a dozen years ago. No wonder we’re confused. Digging up news is hard, and expensive. Punditry is cheap. Kurt Vonnegut drew asterisks in “Breakfast in America” to emphasize a point about opinions, everyone having one. Suggesting it would be in Facebook and Google’s business interests to contract local news media for coverage only follows a simple, hallowed journalistic approach: Follow the money. Yes, I know this is highly unlikely, complete fantasy. Progress doesn’t work this way. Generally, there need to be ashes from which the new or reborn can arise. It’s just hard to watch the house burn, knowing what doesn’t need to be lost and how easy, really, it would be to preserve in everyone’s best interests.